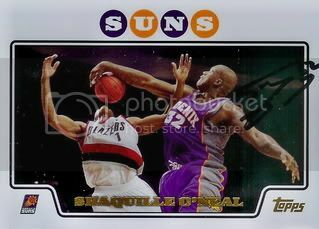 Around the beginning of summer I saw where a few people get back autographs from NBA legend, Shaquille O'Neal. I picked up his 2008 Topps card and sent off a request. As the weeks passed, I began to think that my card probably wouldn't be coming back. To my surprise it showed up in the mail today signed in black. Thanks, Shaq! 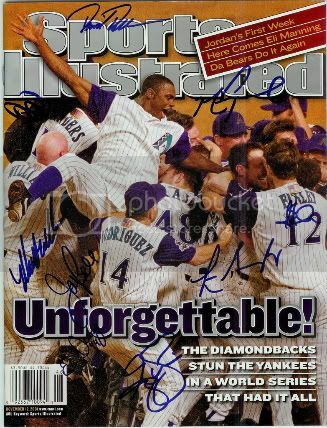 Probably the coolest thing I got signed at the 2011 All-Star Game Fan Fest was a Sports Illustrated from when the Diamondbacks won the World Series in 2001. Back in February, my wife found the magazine in a box she hadn't gone through since we moved. I asked if I could have it. She obliged and I quickly began thinking of how I was going to get it signed. A few weeks later, I got to work. At the Diamondbacks Fan Fest I was able to get autographs from D-Backs legends, Mark Grace and Matt Williams. At the All-Star Game Fan Fest, I was able to add a lot more. It is now signed by nine members of the 2001 World Champion Arizona Diamondbacks. Pretty cool. In addition to a bunch of Diamondbacks Legends, I was also able to get autographs from a few Hall of Famers at the 2011 All-Star Game Fan Fest. 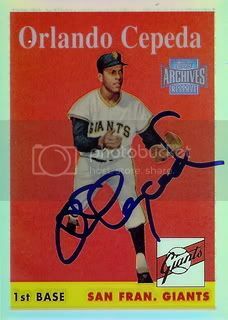 We had another long wait to get an autograph from Orlando Cepeda but again it was worth it. 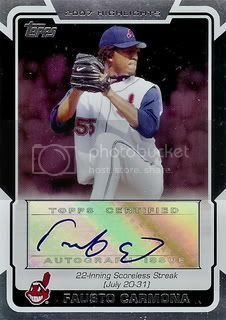 Orlando signed his card from the 2001 Topps Archives Reserve set for us. The 1958 Topps design looks even better as a Refractor. 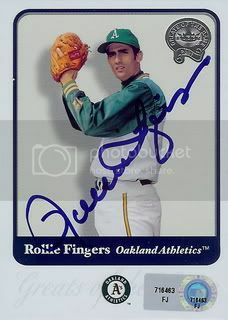 After standing in line for about two hours, Rollie Fingers signed his 2001 Fleer Greats of the Game card for us. 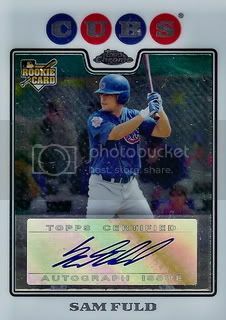 It was worth it to get this great looking card from arguably the nicest Greats of the Game set. 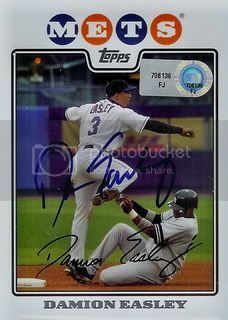 In addition to his card from the Mets Team Gift Set, we were able to have Damion Easley sign the Gold Foil version of his regular 2008 Topps card. One of the cool things about the autographs at the All-Star Game Fan Fest is that the MLB Authentication guys are on site. Check out the shiney authentication sticker near the upper right of our card. 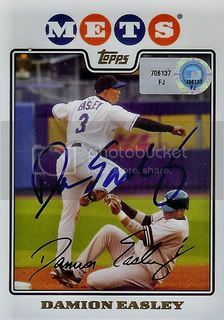 One of the players signing autographs at the All-Star Game Fan Fest was former Diamondback, Damion Easley. Lucky for us Damion had a card in the 55-card Mets Team Gift Set. 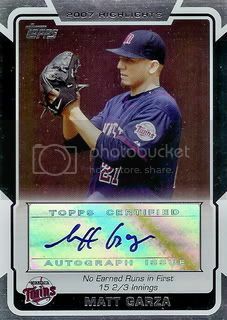 My dad and I were looking through a box of his baseball cards last week and we found a few certified autographs from the 2008 Topps set. The final card is from the 2008 Topps Chrome set and is of Tampa Bay Rays star, Sam Fuld. 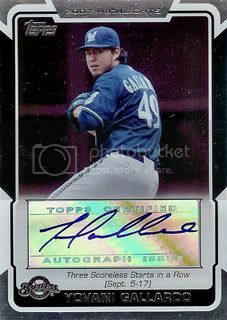 The third is of Milwaukee Brewers starter, Yovani Gallardo. The second is of former Minnesota Twins starter, Matt Garza. 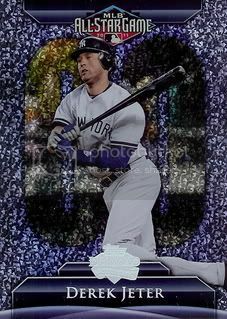 The first is of Cleveland Indians pitcher, Fausto Carmona. Thanks, Dad! Time for our third annual All-Star Game post. 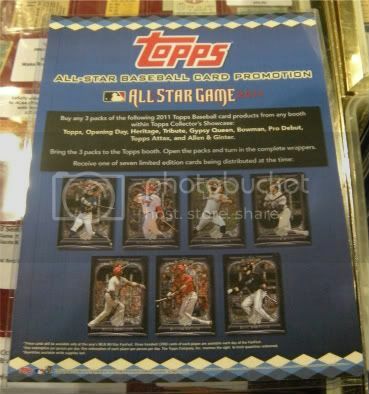 This year we have signed 2008 Topps cards from twenty-four players on the All-Star game rosters. This is down one from the 2010 All-Star Game. The cool part about this year's game is that I'll be there in person to watch all of these guys play! 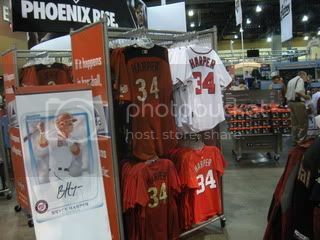 At Fan Fest there's a big clubhouse store where you can buy all of your official All-Star souvenirs. I was surprised to see a GIANT Bryce Harper display right near the store's main entrance. Sure they have a few Alex Rodriguez All-Star Game jerseys or Justin Upton t-shirts for sale too but they were mixed in with everything else. Bryce got his own section complete with a banner featuring his 2011 Bowman card. 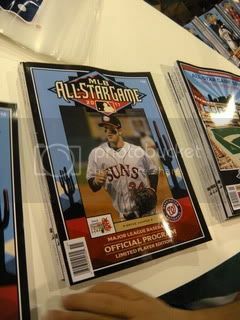 They also had All-Star Game programs for sale. They have one made up for each All-Star. 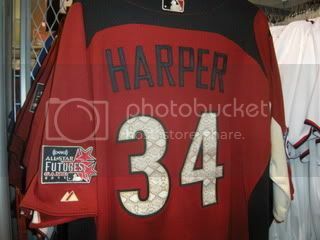 I think they've done this for a few years but I've never seen one for someone who was playing in the Futures Game. 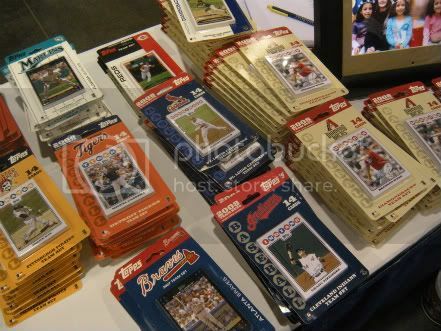 Topps had a booth set up at Fan Fest. They were giving out free 3 card packs from the 2011 Topps base set. Of course I went home with a few of those but the most exciting part was their pack redemption. 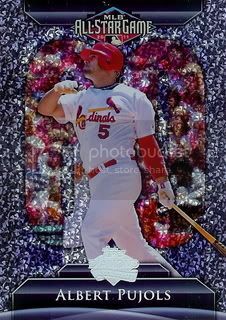 If you bought three packs of any 2011 Topps product you got to choose one of 7 Topps 60 Diamond Anniversary All-Star cards. 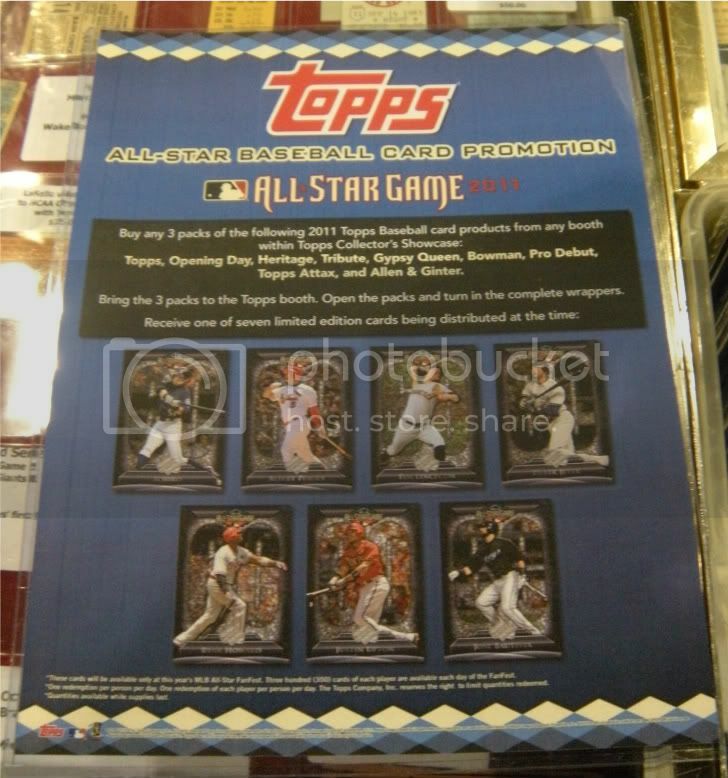 I picked up Albert Pujols, Derek Jeter, and Justin Upton. The All-Star Game is in town and I was lucky enough to spend Friday and Saturday at Fan Fest. Overall I had a good time. Got some autographs, bought some baseball cards, & took some pictures. I'll do a few seperate posts today with the highlights. One of the first things I noticed when we got to the Phoenix Convention Center on Friday morning was a small booth with some Topps 14-card Team Sets spread out on a table. I walked over and low and behold most of them were from 2008. For a $10 donation I picked up the Florida Marlins and Detroit Tigers for our collection. 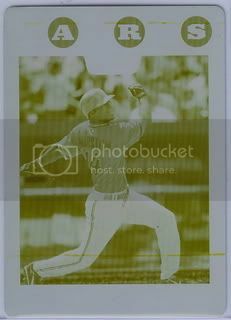 Every once in awhile I remember to search eBay to look for Printing Plates. I'm pretty picky about which ones I bid on. It has to be of a player I like and at a good price. 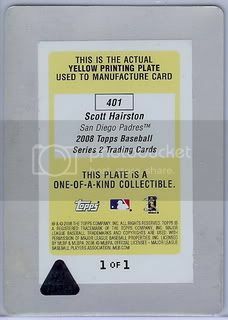 I finally landed this one of former San Diego Padres outfielder, Scott Hairston. 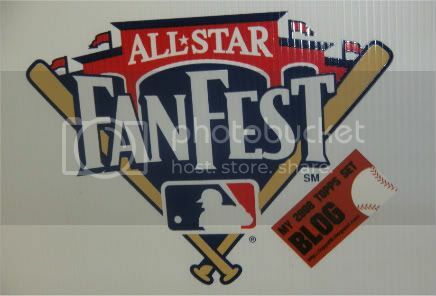 On a side note, today is the first day of the 2011 All-Star Game Fan Fest. I'll be at the Phoenix Convention Center from approximately 9am - 9pm today. Cameron Maybin has made alot of news this week with his three ball walk over the weekend. 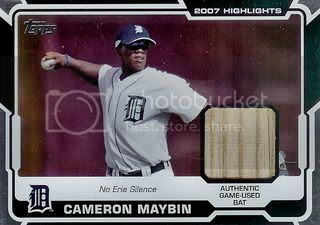 Here's a bat card of his from the 2008 Topps set. Cameron's actually been doing pretty good lately. I even almost added him to my fantasy baseball team... almost. 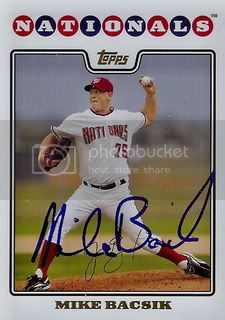 Former Washinton Nationals pitcher, Mike Bacsik signed a card for our set. 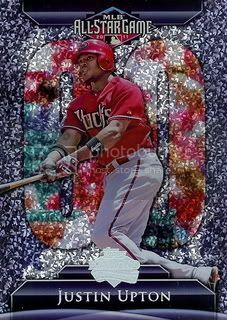 I remember Mike best for giving up career home run # 756 to Barry Bonds. 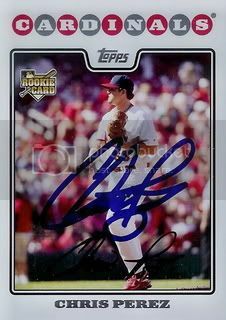 Cleveland Indians closer and 2011 American League All-Star, Chris Perez signed a card for our set. I can't remember exactly when we got this card signed. It had to have been last summer. I scanned it a really long time ago but somehow didn't add it to our Photobucket until now.